Amid Recession, Brazil Struggles With The Huge Costs Of The Olympics : Parallels Brazil was riding high when it was awarded the 2016 Olympics seven years ago. But the country is now in economic turmoil and facing a rash of problems as it prepares for the games in August. 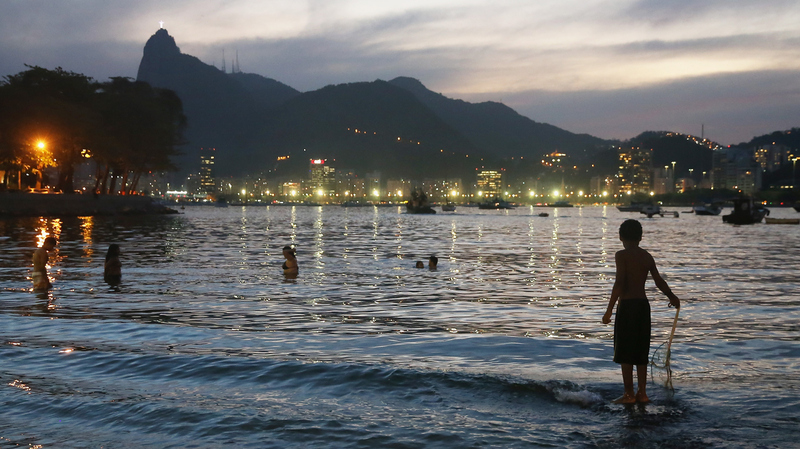 A boy fishes in polluted Guanabara Bay in Rio de Janeiro in August 2015. The bay will be the sailing venue for the Olympic Games this summer. Brazil is facing concerns over polluted water, mass transportation and budget issues as it prepares for the games. Instead of the Summer Games, you might as well call these the gloomy games. Back when Rio de Janeiro was awarded the 2016 Summer Olympics, seven years ago, the country was on a high. The economy was growing, the middle class was expanding and the country seemed finally to be realizing its potential. Marcelo Barreto, a famous Brazilian TV sports journalist who has covered mega sporting events all over the world for two decades, recalls that electric atmosphere when his home city got the games in 2009. "It was a very optimistic moment for Brazil, and I think the Olympics were another message that we were being accepted by the developed world," Barreto says. "It wasn't about the events themselves; it was about Brazil." Things look very different now as Brazil prepares for the opening ceremony on Aug. 5. The economy is crashing. There's a huge corruption scandal. Impeachment proceedings are underway against President Dilma Rousseff. There's panic over a mosquito-borne virus linked to brain damage in infants. By the time August rolls around, Barreto believes "we are going to deliver good games. We are happy when people come and we can share the moment." There is a race, as always, to get things done in time. Things won't work exactly as planned, but the games will go on, according to Barreto and others. Construction workers building the Olympic Stadium in October 2015. While most venues are ready, or close to ready, costs have been higher than planned and the country is suffering from a recession. Organizers say they are looking for ways to cut costs. But at present, "I think there is a feeling of disappointment in the air, with Brazil itself," he notes. "People are concerned with more pressing, urgent things right now." Like a health care crisis in Rio. Rio's state government gets much of its revenue from oil production. But the price of a barrel is very low, leaving the state practically bankrupt. The most visible sign of this has been at state hospitals. On a recent day, dozens of people were crowding the entrance of the Hospital Albert Schweitzer, creating a chaotic scene outside the hospital they could not enter. Cristiani Silva was waiting to see her husband, who was being treated inside. She says it's a huge contradiction for Brazil to be hosting these games, spending money the country doesn't have when there's a health crisis. "I was happy about the Olympics before," she says. "They said it was going to make our city better. But it was all a sham." One woman recently gave birth on a sidewalk in Rio because a hospital wasn't admitting patients owing to funding shortages. The main doctors union said this week that the health system in Rio isn't capable of dealing with the influx of tourists for the games. "The crisis has completely impacted the Olympic Games," says Roberto Maltchik, the Olympics editor at Rio's biggest daily, O Globo. "They have no money. They can't incur any last-minute costs," he says. Budgets have been slashed across the board. 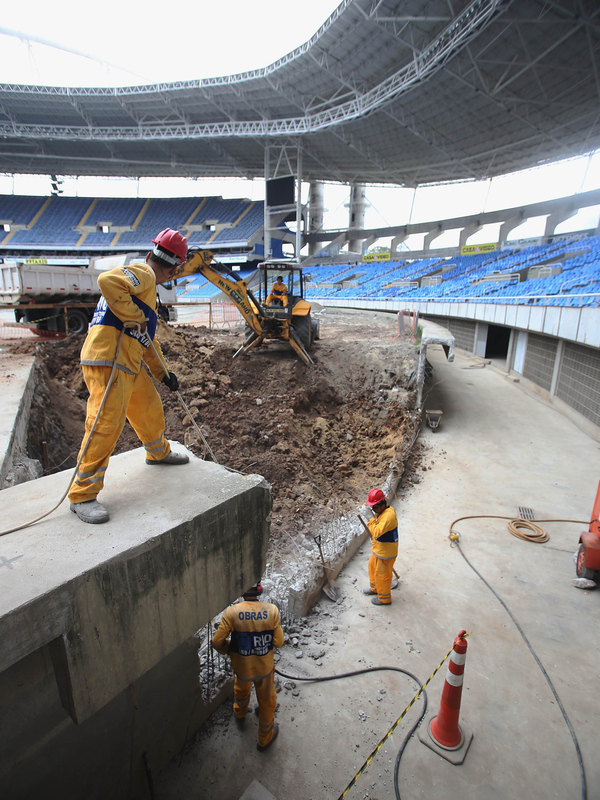 One of the Olympic stadiums just had its water and lights cut off because of unpaid bills. The builder for two other venues has had to lay off workers and hasn't paid suppliers. Athletes are also feeling the crunch. Davilani Cruz, a member of Brazil's national taekwondo team, says a monthly stipend provided by Brazil's Ministry of Sport hasn't been paid in five months. "I think this isn't something that should be happening in an Olympic year," Cruz says. "We athletes depend on the stipend to travel to competitions and we don't have a lot of other support, so we end up lagging behind." The overall costs are difficult to pin down, but Brazil budgeted around $13 billion and is expected to go well beyond that, according to one report. At an event this week marking the opening of the athletics stadium, Rio's mayor, Eduardo Paes, faced a barrage of questions about the hospital crisis and budget cuts. "We have enough money to do everything that is supposed to be done, as you can see here," he said. "We are not China [which hosted the 2008 games]; we are not England [which hosted the 2012 games]. We are not a rich country. So every time we can cut some of the budget of the Olympics, we will do it. This is not going to be an Olympics of wasting money." So the mayor is selling the crisis as a good thing. Barreto, the sports journalist, says what's happened to Brazil might serve as a lesson to other countries considering hosting the games. "It's too much money," he says. "If a Third World country could help deliver this message, I think it would be a positive role in the history of Olympics."